The sweltering of North India, aggravated by manic urbanisation, just as manic use of personal automobiles, the steady thinning of tree canopies, and small businesses forced to buy diesel generators – in the tens of thousands, each emitting hot fumes that further trap already heated layers of sooty air – is an annual pre-monsoon epic that no-one has the energy to write. This panel of four maps shows us where India baked during the last week of 2014 May (and now, Delhi has experienced a record its residents did not want). 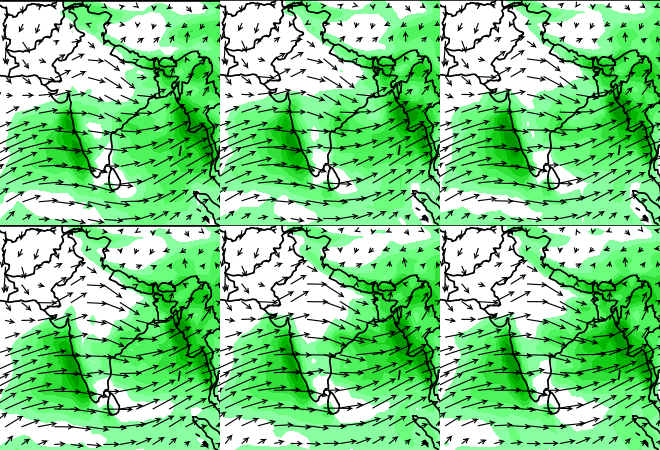 The high temperature belts (top left map), 40-45 Celsius, covered most of central and north-western India (Maharashtra, Madhya Pradesh, Gujarat, Rajasthan, Gangetic Uttar Pradesh, Haryana, Punjab and Delhi). 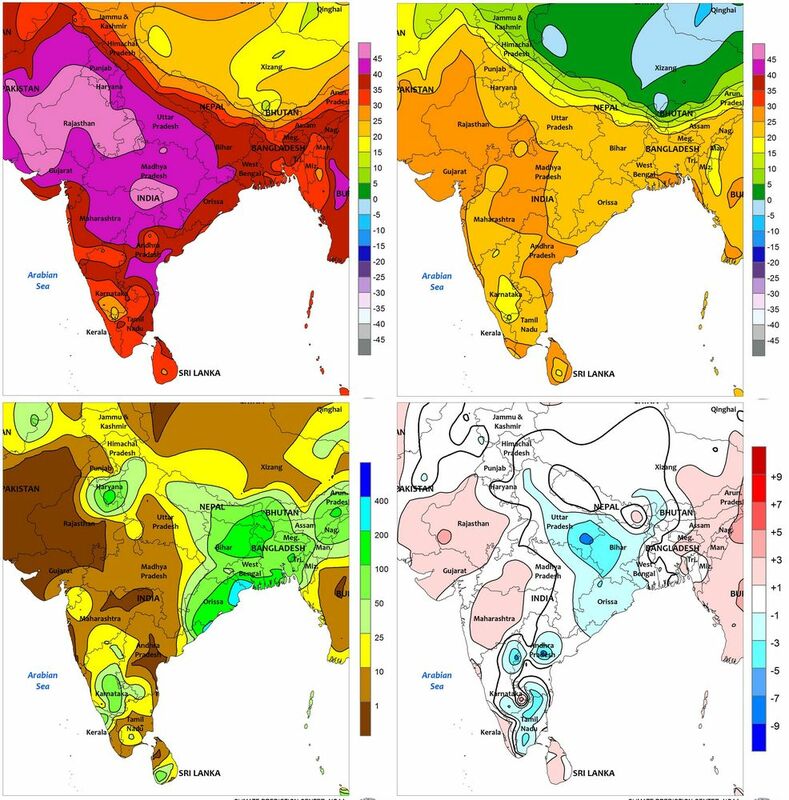 Minimum temperatures (top right), 20-15 Celsius, are seen in two pockets – south interior Karnataka and in the North-East over Manipur and Mizoram. Read these from top left – 21, 22 and 23 June. Lower row – 24, 25 and 26 June. 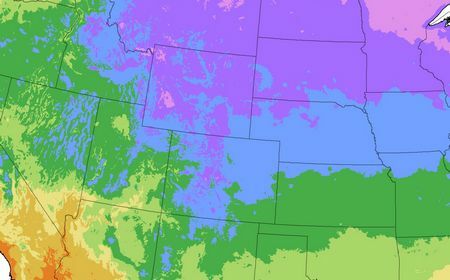 The green shading is the rain-bearing cloud cover. After 20 June the peninsula will have rain in most meteorological zone but North and north-west India will still await the monsoon system. 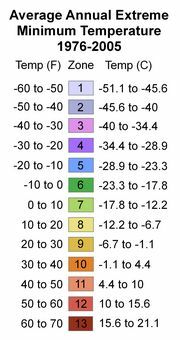 What these don’t show, but which the longer range forecast Indian Institute of Tropical Meteorology (Pune, Maharashtra) has on record, is that monsoon 2014 will not touch northern India until the fourth week of June. 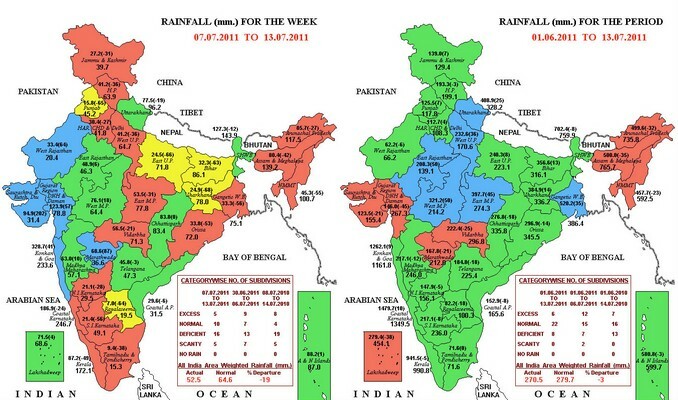 Rain-bearing cloud and wind systems will cover, in this forecast, peninsular India by around the 16th or 17th of June, but it will be another week before they deliver some relief to the cemented and asphalted surfaces of the National Capital Territory and its parched surroundings. 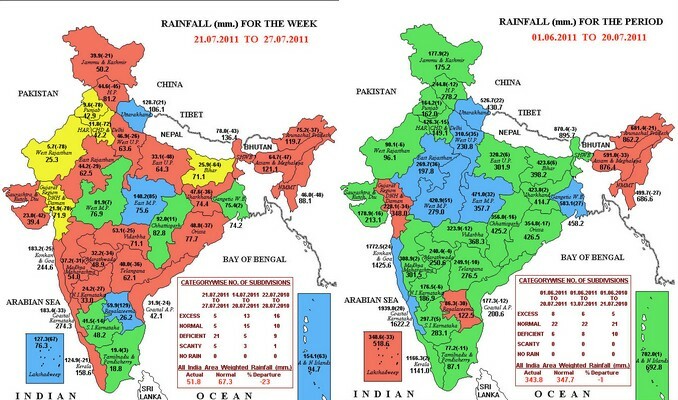 These very helpful maps are used by the Pune-based met researchers as part of their monsoon monitoring and forecasting partnership with several international climatoloigcal research institutes, chief amongst them the National Oceanic and Atmospheric Administration (NOAA) of the USA through its Climate Prediction Centre. The Tropmet – as the Pune group is usually called – has bequeathed to us a definition (perhaps for this season only, subject to revision when climate change asserts itself) of monsoon rain that is in part scientific and in part geographic, which I think is a good sign (the Indian Meteorological Department will disagree, but we know better). The faster Tropmet decides to communicate in language appreciated, and understood, by Bharatiya citizens, the more said citizens will find an interest in correcting the misconceptions of scientists. Tropmet says: “Rainfall within the summer monsoon season is mainly punctuated by the northward propagating monsoon intraseasonal oscillations (MISOs) with timescales of 30-60 days that manifests as spells of heavy rainfall and periods of quiescent rainfall, instead of a continuous deluge.” In the Konkan, we like our continuous deluge and the old-timers would have sixteen names for different sorts of deluge (and an equally rich chest of monsoon nouns for other sorts of rain). 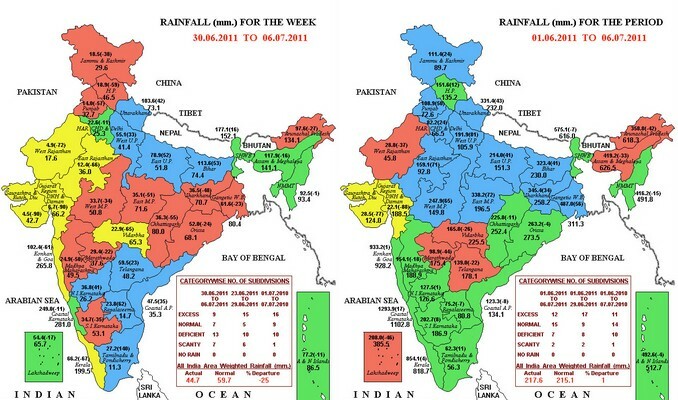 The India Meteorological Department, Ministry of Earth Sciences, has issued a new forecast for the 2011 south-west monsoon and the overall number does not at all look like what the country needs. 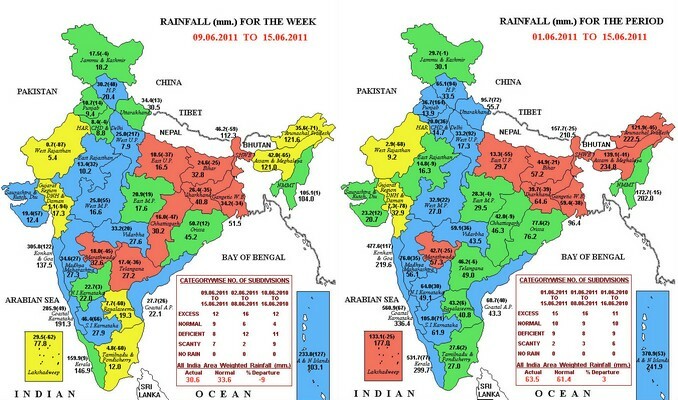 The IMD has said that by the end of the second half of the 2011 monsoon, it expects the national average to be 90% or thereabouts of the long period average (called LPA by the Met). India’s central government has only recently announced the foodgrain estimates for the year, at a record 241 million tons. The question now is, what will this lower prognosis mean at district level, and for those districts which supply the country its cereals, vegetables and commercial crops. We’ll have to wait and watch for more indicators. 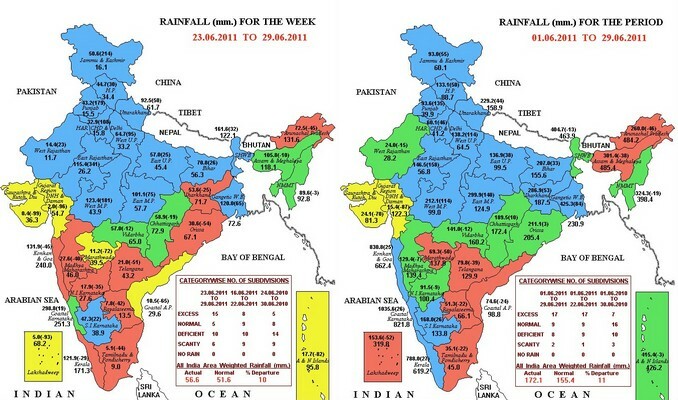 The main paragraphs of the IMD statement follow, and I have put together picture panels based on the rainfall maps issued by the IMD every week. 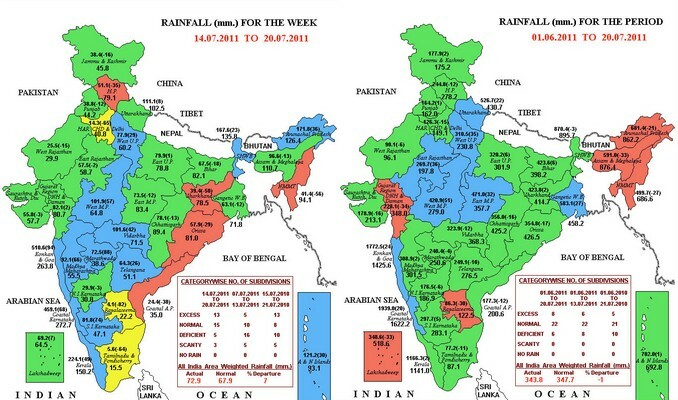 These show the regional variations of rainfall and how they have moved over time. One of the major limitations in livestock sector planning, policy development and analysis is the paucity of reliable and accessible information on the distribution, abundance and use of livestock. 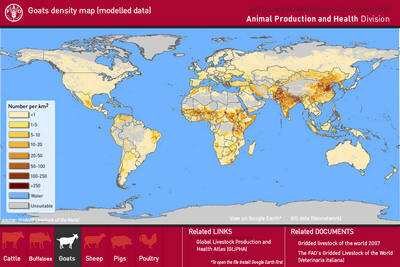 With the objective of redressing this shortfall, the Animal Production and Health Division of FAO has developed a global livestock information system (GLIS) in which geo-referenced data on livestock numbers and production are collated and standardized, and made available to the general public through the FAO website. 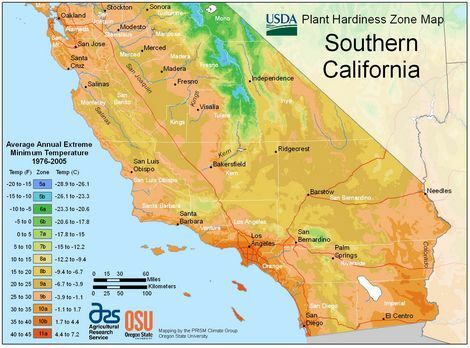 Where gaps exist in the available data, or the level of spatial detail is insufficient, livestock numbers are predicted from empirical relationships between livestock densities and environmental, demographic and climatic variables in similar agro-ecological zones. The spatial nature of these livestock data facilitates analyses that include: estimating livestock production; mapping disease risk and estimating the impact of disease on livestock production; estimating environmental risks associated with livestock due, for example, to land degradation or nutrient loading; and exploring the complex interrelationships between people, livestock and the environment in which they cohabit. It is through quantitative analyses such as these that the impact of technical interventions can be estimated and assessed. Also, by incorporating these data into appropriate models and decision-making tools, it is possible to evaluate the impact of livestock-sector development policies, so that informed recommendations for policy adjustments can be made. The components of the information system thus created include: a global network of providers of data on livestock and subnational boundaries; an Oracle database in which these data are stored, managed and processed; and a system for predicting livestock distributions based on environmental and other data, resulting in the Gridded Livestock of the World (GLW) initiative: modelled distributions of the major livestock species (cattle, buffalo, sheep, goats, pigs and poultry) have now been produced, at a spatial resolution of three minutes of arc (approximately 5 km). These data are freely available through the GLW website1, through an interactive web application known as the Global Livestock Production and Health Atlas (GLiPHA)2, and through the FAO GeoNetwork data repository. As well as detailing various components of the GLIS, this publication explains how livestock distributions were determined, and presents a series of regional and global maps showing where the major ruminant and monogastric species are concentrated. 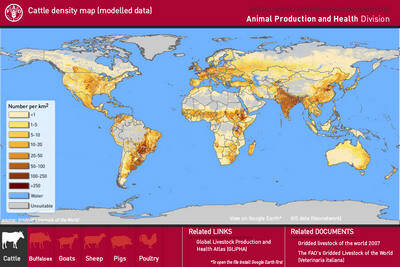 Spatial livestock data can be used in a multitude of ways. 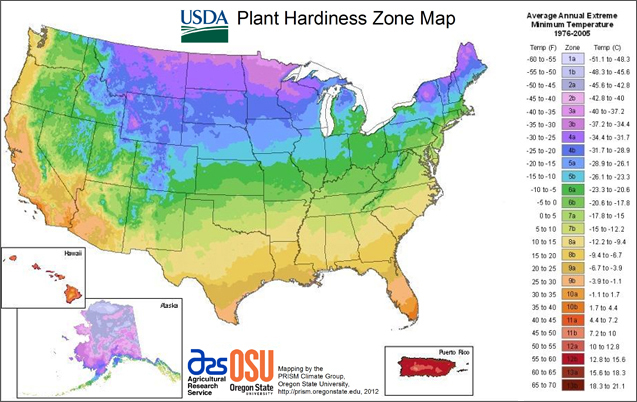 Various examples are given of how these and other datasets can be combined and utilized in a number of applications, including estimates of livestock biomass, carrying capacity, population projections, production and offtake, production-consumption balances, environmental impact and disease risk in the rapidly expanding field of livestock geography. Informed livestock-sector policy development and planning requires reliable and accessible information about the distribution and abundance of livestock. To that end, and in collaboration with the Environmental Research Group Oxford (ERGO), FAO has developed the “Gridded livestock of the world” spatial database: the first standardized global, subnational resolution maps of the major agricultural livestock species. 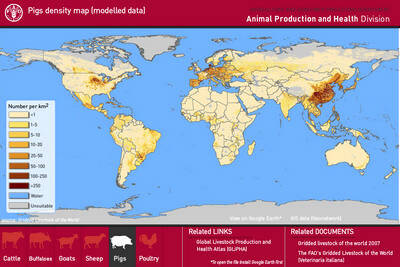 These livestock data are now freely available for downloading via this FAO page.